I enjoy doing custom work, and will gladly take your requests for one-of-a-kind pieces. I have done logos and animated logos for people who have asked for them. I have expanded into animation and have 26 videos on You Tube at: nightbloomingcards7. See the list of links for easy access to any of these sites. My blogs include two turorial sites as does my You Tube videos. I am always willing to share how I create these designs. I think I have developed techniques that many people could enjoy using. In fact, I plan to create a studio of artists around these ideas, so if you are interested; let me know. Feedback on this or any of my blogs is welcome. 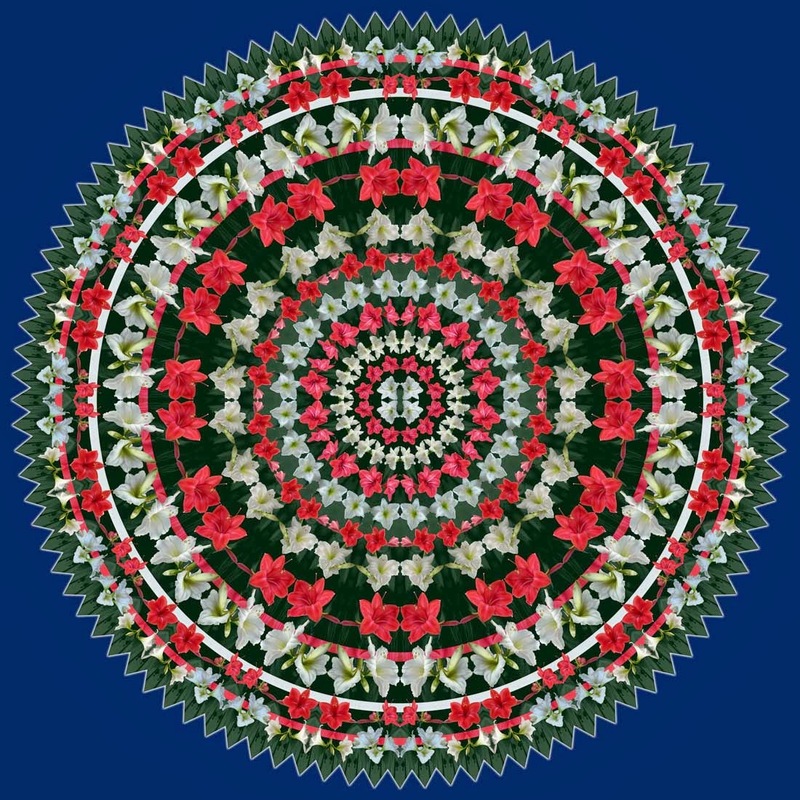 I have started a new website called Stately Mandalas to sell my collection of state mandala plaq You will find it at: www.statelymandalas.com I am working on the design for New Hampshire, and other artists starting on Massachusetts and Maryland. I have revised my animated video with new music by Daniel ML @ Fiverr.com. He created this instrumental specifically for this video, and is ready to work on my other states as I finish them. I have added a fourteenth blog: Traveling Mandalas. 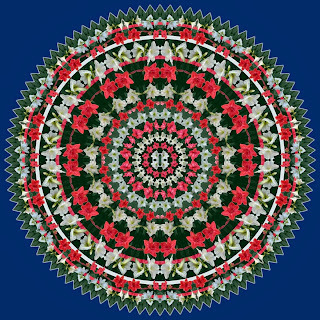 Mainely Mandalas will be a subsidiary of it in terms of the series of 50 state mandalas. I will, however, continue to post other Maine themed images here as with the Christmas card design on the previous post. Part of my revision of this video was to add the black & white US map with the zoom into the northeast, and Maine popping out. I will do this with each of the state videos. I have completed my Christmas card design for this year. I used photos of amaryllis flowers I grew last year. Shown above is the mandala and the mandala array. This is the seventh year I have posted digital Christmas card designs. All are available on my Zazzle store, so you can choose your favorite. 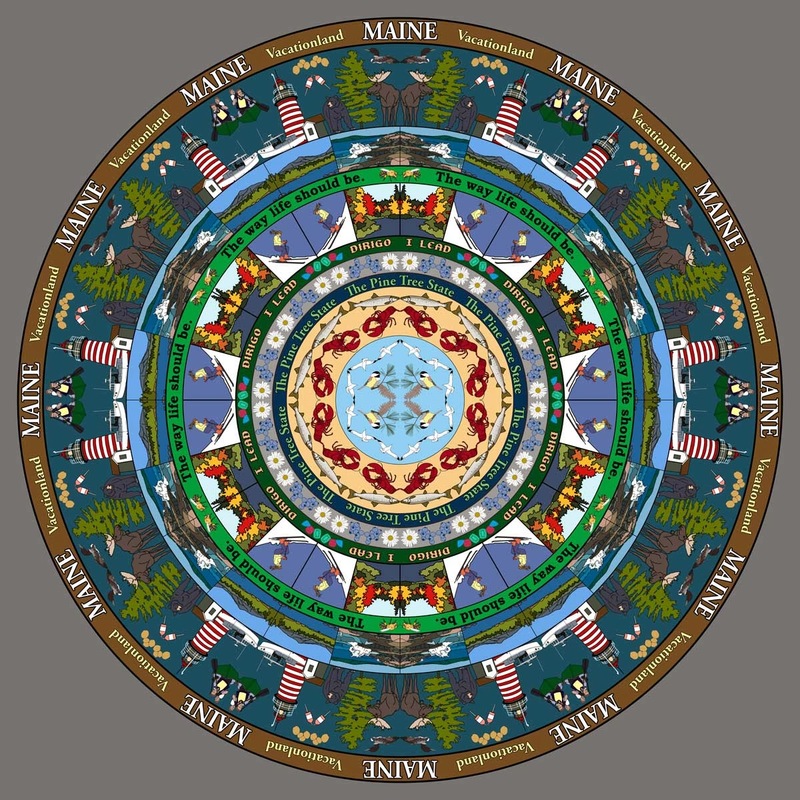 I have created a mandala for the state of Maine which uses official state bird, animal, and so on. 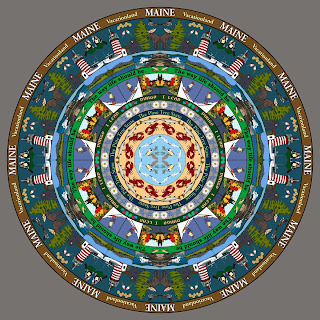 This is the first of what will be 50 mandalas for all the states. I am starting with Maine and will do Arizona next, and branch out from there. I will animate this design next. I can also customize it for people to include something someone feels I have left out. I want to create a series, so that people will be able to collect one for every state they have visited. 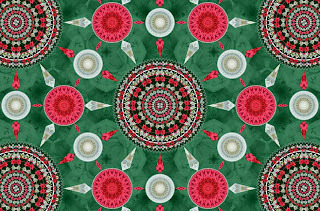 ****************************************************************************************************************** Starting from the center, the symbols are the pine cone and tassel as the state flower. The chickadee as the state bird. The sea gull which is not an official symbol, but to think of Maine without associating these coastal birds is impossible. A cooked lobster which had to be included as Maine is famous for it's seafood. The landlocked salmon is the official state fish. Maine has long been known as the pine tree state. Maine also has the best blueberries in the world, and I included a daisy to represent the many wildflowers found here. The officilal state motto is Dirigo which is Latin for I lead. On the same ring is a cluster of tourmaline gems which is the state gemstone. Continuing out, is a stream surrounded by fall foliage. I think one thing that makes our fall colors so spectacular is that often the reds, oranges, and yellows of the deciduous trees are contrasted against the deep greens of the conifers. On the same ring is pictured a down hill skier, as Maine is a great state for winter sports. The next ring of text shows the state slogan declaring that life here is the way it should be. People come here from all over the country and world to see the spectacular scenery, enjoy the ocean, and to decompress from city life. We especially serve the people from the big cities of Boston and New York. The next ring shows an ocean surf scene as seen at Schoodic Point. It has to be one of the most beautiful spots in the whole country. Also shown is Mt Katahdin which is the tallest mountain in the state, and the head of the Appalachian Trail. Working out to the edge, is the moose, which is the official state animal. The black bear is shown with the moose. While it is not an official state symbol, it represents the rugged wild habitats which our geography provides. It is also the mascot for the University of Maine at Orono. Between the moose and bear is a tall white pine which is the state tree. Above the moose is the loon. What the seagull is to the coast, the loon is to our many lakes and ponds. Next to the bear is one of the many picturesque lighthouses which dot our shoreline. Next to that is a lobster boat. Above the boat is a canoe. I did this digital painting from a photo of a couple of participants in the spring Kenduskeag Stream race. Also on this ring is a pair of lobster buoys and a cluster of Maine grown potatoes. The outer ring of text declares that Maine is known as Vacationland. ******************************************************************************************************************* I will be posting this design on Zazzle on various products including posters, postcards, greeting cards, t shirts, mugs, plates, and more. 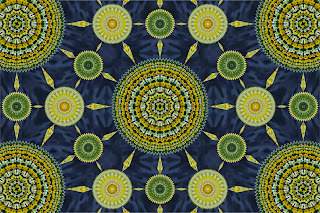 I will start another blog to show the whole series of states, and will eventually create another Zazzle store for that purpose, but for now; just go to Mainely Mandalas blog or Zazzle category. As always, feedback is welcome. 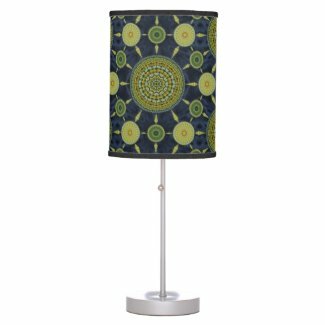 Zazzle now offers table and hanging or pendant lamps. I have used my expanded arrays to design 31 lamps for my store. This one is made with my daffodil array. My creations look especially good with light shining through. 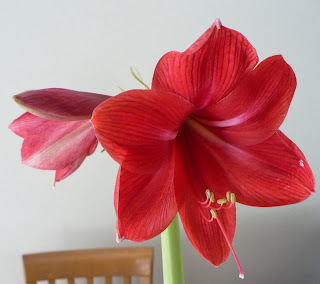 I planted 5 amaryllis bulbs this year with the idea that next year I will use photos of the flowers for my Christmas card design. They are such beautiful flowers that it should be my best holiday design yet. The following year, I will do a nativity mandala that I've been working on for three years. Merry Christmas! I have completed the mandala array made with photos of daffodils.